A telecommunication network diagram is used to draw a graphical chart of a telecommunication network. Generally, a telecommunication network diagram usually consists of a network that is made up of interconnected groups or systems. 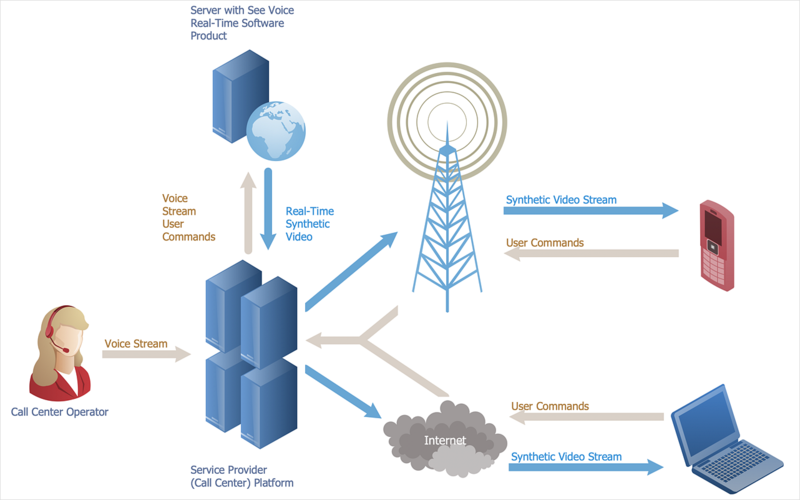 Generally, the telecommunication network diagram represents a system consisting of computers, servers, telecommunication devices, switches, satellites, wireless transmitters, antennas, cables, etc., that connect a set of remote end-points. It also shows a telephone commutation, that connects calls between land-lines. ConceptDraw DIAGRAM allows you to draw a simple and clear Telecommunication Network diagrams using Telecommunication Network Diagrams solution. Run a ConceptDraw DIAGRAM new document and open the library from the Telecommunication Network Diagrams solution. ConceptDraw DIAGRAM gives you the ability to collect the proper objects from many libraries quickly using the ConceptDraw internal search system. Enter the name of the object you are looking for (e.g. “Wireless router”) into search field and press Enter. Add the Telecommunication Network elements to the diagram by dragging them from library to the document page. Result: This type of diagram is particularly useful for network engineers and designers in compiling detailed network documentation.